Standup paddleboard (or SUP) Fitness & Yoga is asana practiced while balancing on paddleboards. It is an exciting way to bring your practice out of the studio and into a serene natural setting, typically on a lake, river, creek, or calm ocean cove. With a floating surface in place of a mat, all poses take on new challenges and falling (splash!) can be part of the fun. 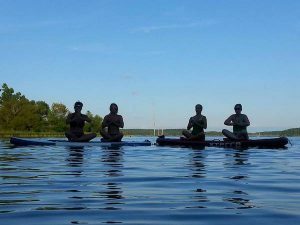 We are offering SUP Fitness and Yoga training as a specialty elective that you can use as an add-on to your Yoga Legacy RYT200 Certification and expand your teaching credentials. The course is facilitated by Earth Creature, LLC and Yoga Legacy, LLC, and accepted by Yoga Alliance (YACEP & RYT500 Level in Yoga Legacy Program). 1401 Evans Rd, Cary, NC 27513. Possible open water locations are Lake Crabtree, Jordan Lake, Falls Lake, Neuse River, and Robertson Millpond Preserve. These will be dependent upon the weather forecast and in consideration of the convenience for each trainee. Register now: Don’t delay. Space is limited. Requirements: Training will include an ACA Level 1 SUP Skills Assessment, trainee must pre-register for ACA membership ($15) prior to training for the Skills Assessed Member title at the ACA website. SUP yoga trainee must have an RYT200 Certification or currently be registered in Yoga Legacy RYT200 Program (certificate for SUP Yoga will be provided after graduation from RYT200 Program).